Home » General Interest » Why are traffic lights red, yellow & green ? Have you ever sat at a crossroads waiting for the lights to change and idly considered “I wonder who invented traffic lights ? and why are they red, yellow and green?” Well if so this article, which we’ve added to the great body of knowledge we like to call “internet fluff”, will hopefully answer those questions. Traffic signals actually predate the existence of the car. One was installed in London, outside Parliament, in 1868. This signal had two semaphore arms, like a railway signal, that acted as a physical impediment to oncoming traffic. The device was designed to control the flow of pedestrians, and some feature was needed to make it functional at night. The easiest solution was to adapt the system used for railway signals – red and green gas lamps would signify when one could proceed (green) or had to stop (red). This prototype wasn’t a rousing success – it blew up shortly after its introduction, killing a policeman. 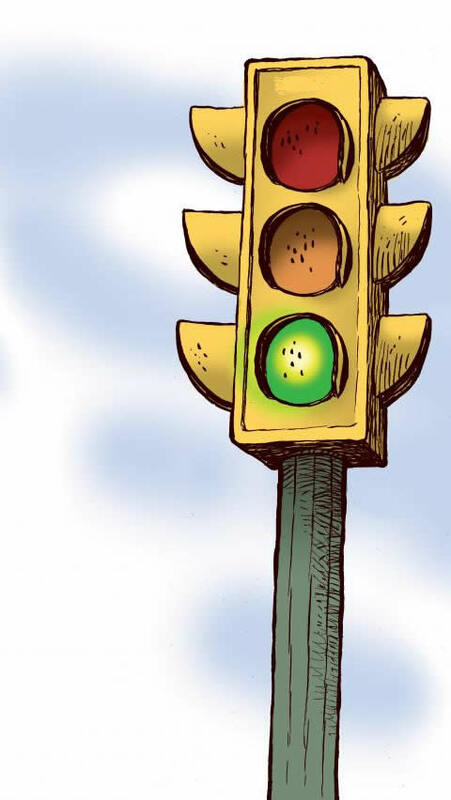 A lively controversy has developed over where the first modern traffic signal designed to control automobile traffic was in use. Although the US cities of Salt Lake City, Utah, and St Paul, Minnesota, lay claim to the crown, the green-red signal installed on Euclid Avenue in Cleveland, Ohio, in 1914 is generally credited with being the first. As to the incorporation of yellow, Engineers tried using green and red lights in a way that, Green was for caution, red for stop and clear for go but soon the engineers realized that the sunlight reflecting off clear lights gave false signals. Thus they came up with the ingenious idea of having yellow for caution and making green for go. Although the traffic signal’s colours might have been arbitrarily lifted from the railway’s, there is an important safety reason for the consistency of the configuration today. As recently as the 1950s, many traffic signals, especially in busy urban intersections, were displayed horizontally rather than vertically. The current vertical design with red on top was adopted in order to aid colourblind individuals who might be confused by different layouts.